Having grown up in Dragon Forge LTD, my forging experience has been hands on as I hit the ground running at the age of 15. Although keeping up with a high end architectural blacksmith shop, I could recognize that my weakness was forging hand tools in the form of hand hammers, handled top tools, hardy tools and tongs. I have had multiple attempts and failures over the years on making tools and never quite satisfied with the quality, furthermore I have always invested in other tool makers to fill this gap. Yet it was a topic that had always bugged me and I have been making efforts to fix that. A couple years ago I made goals to attend various classes and demonstrations to see what was I “missing” when it came to tool making. There was a part, a technique, a tip, a step…something that had always felt left out. In my opinion it should not take a day to forge a hammer. 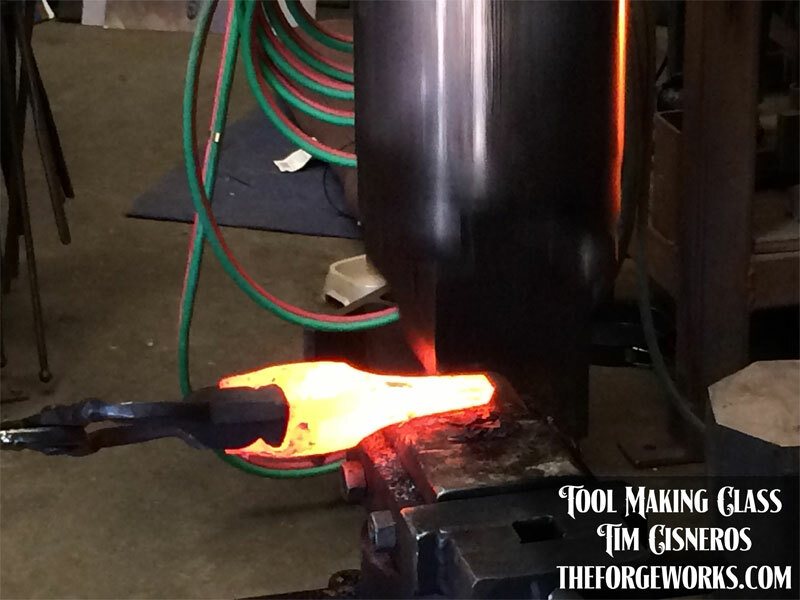 There are classes that ride on the “experience” of forging. That’s great, yet I have work to get done and was looking for the approach of an efficient and sturdy theory. 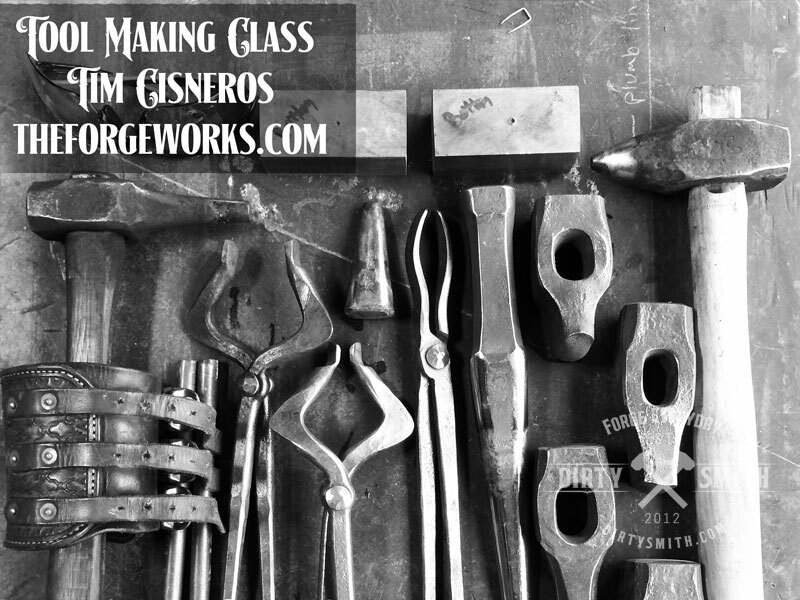 I took a one-on-one tool making class hosted and taught by Tim Cisneros June 27 – July 1st 2016. His studio is located in the Half Moon bay area and he has a large amount of experience in architectural iron work, furniture, as well as forging artistic sculptures. By the end of the first day I had found more than expected as Mr. Cisneros cleanly demonstrated how to forge a handled punch, hand drift, pair of tongs and various other tools. This was it! This was the class I had been looking for. Maybe it was the fresh ocean air, the low fog horn that went off every 7 seconds, the planets were in alignment, or Tim’s ability to teach…I can’t say what it was that I was missing, but something clicked. To top it off…I was going to be here all week. Metaphorically speaking I had a deep cup and planned to fill it. Classes like this go beyond what a book can show, what a youtube video can share as there is no replacement for a hands on class. “There are no secrets here.” A phrase that Tim Cisneros leads the intent of his tool making class. He shared an experience having met various smiths from around the world, one of which was Claudio Botterro; whom made an impression on him and greatly influenced his perspective and approach of the craft. Little did I know Tim was going to have the same impression on me that week. Each day was greeted with a hand shake, conversations of what we had done the previous afternoon and the plan for the day. Multiple techniques for forging tools varied from using a power hammer and striking at the anvil. Using the tools made prior to make more tools….the possibilities were endless, the approach was straight forward and simple. It was me that needed work. There was a moment where I could see that this was a tool making class, and -in a complementary way- when making tools, they were forging me as well. By learning more and having the assistance of an experienced smith, you are creating yourself as a better resource, new abilities and in a way a forging yourself into a better tool. The class he teaches is complemented for the student. 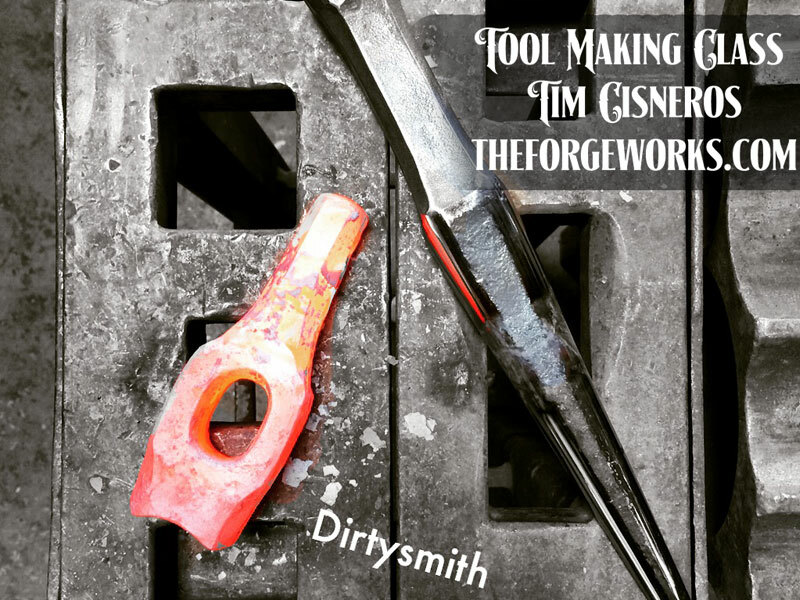 There are a core set of tools to make and after they are completed, Tim asked the: “Well… is there anything you had in mind? Anything you don’t have? Anything you want/need to use daily?” To have this option in a class format is awesome and a rare topic from my previous experiences. I have also been prepped to see techniques from the demonstrator and then have the student make an attempt to replicate the technique. In a way classes are like a job. You are told what to do, how to do it; yet, hopefully the teacher is there to help assist you. Some teachers demonstrate and then leave. I personally don’t do well with that. Tim teaches a class in which he is very involved. Keeping a close eye on you, the student, and if there is nothing to change he lets you do what you came to do, forge tools. Don’t expect him to set back and take a long break while you are working either. If its cleaning up the end of a tool in prep to heat treat to fitting handles to tools, there is always something to do. He is very involved in each step and quick to keep the progress going as he wants you to leave with finished tools. By the end of the week we had 17 tools done and ready for work. A hardy slap on the back from Tim followed by a comical “You’ve done good!” I was feeling more confident about the class and the new techniques I could use in my studio and work. The strings of Stevie Ray Vaughan cried across the shop through the speakers. Tim approached me “Hey…you want to go for a walk?” I nodded as I could feel the beat pulse through my hands from the stereo. Taking a break from the day, we went to Mavericks Beach to see Tim’s bench that he forged and donated to the area (link below.) Grabbing a quick cup of coffee we headed off. During these walks we had discussions that went beyond blacksmithing. Sharing stories of our past that had a value of entertainment, a subtle lesson, even a word of encouragement; I was able to get to know Mr. Cisneros as the gentleman, the smith and teacher. Its one thing to be shown a technique, take a class and return home. Its another to enjoy the person with great character that is teaching it. People with this character and down to earth honesty are hard to find. 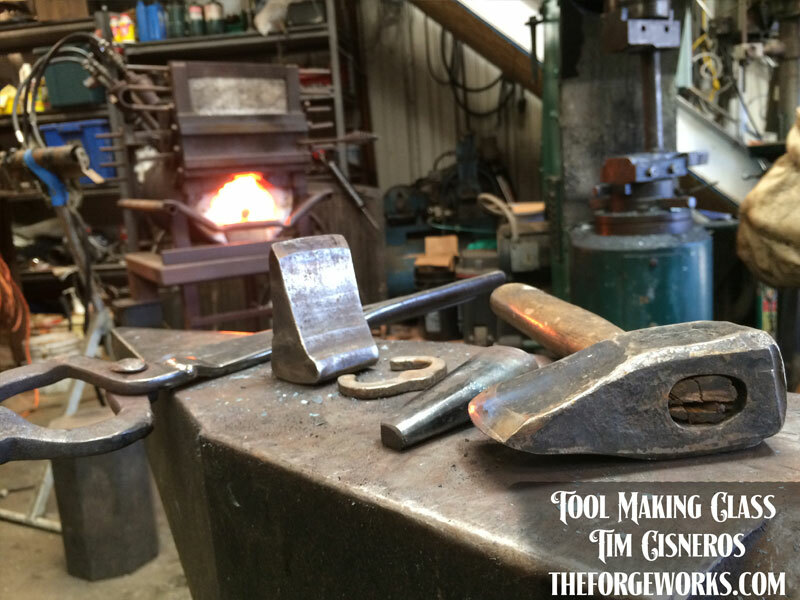 My world of forging continues to grow as I meet more people like Tim. There is always something to learn, gain or simply experience as there will always be more to see in this abyss of knowledge that holds the world of blacksmithing. It can change your life, give you an unspoken confidence and most of all fill that cup you hold. Enjoy the process and, if you can, pick some fun people to help you along the way. I would highly recommend taking this class and/or any workshop Tim is part of. Thank you Tim for the lessons and most of all the experience! *upon looking through my pics I didn’t get many shots of Tim and apologize. I was so engulfed in this class that either they were a bad pic or I simply forgot. Check the links below for more info about Tim, his work and the Bench mention in this post. Rory, nice write up. Sounded like a fantastic experience. 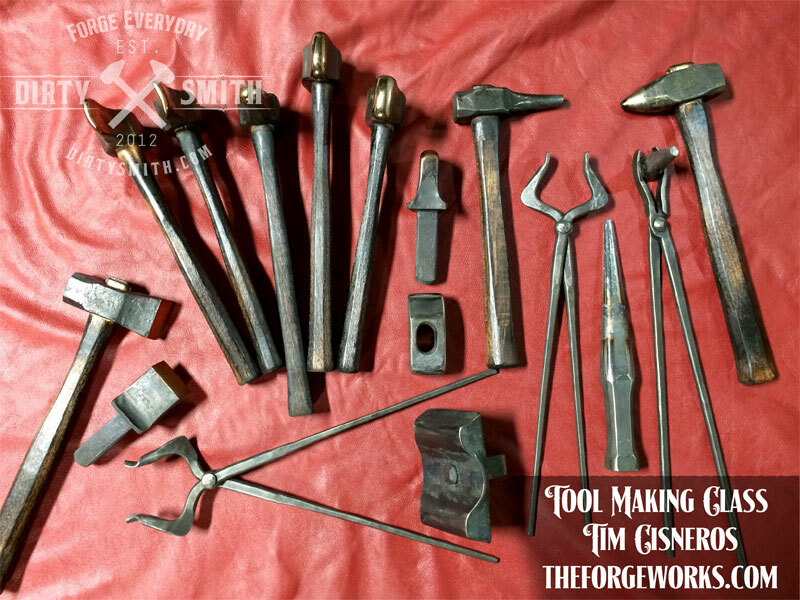 As a new smith, would you recommend taking classes more focused on tool making? Or general smith education. Hey Mike! Take classes that interest you. Some people are into tools more, some are into ornamental iron, some are all about weapons. IMO the more you know, the faster you can get where you want to be. So much to learn and so many to learn from.